Merging living room and kitchen is a common design technique. Open space visually seem more spacious and brighter. 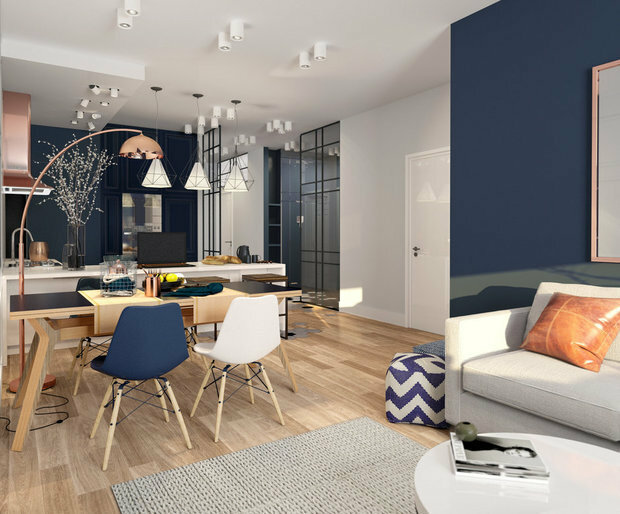 And to make it even and consistent, unified style, will help selected finishing materials, furniture, lighting and decor. 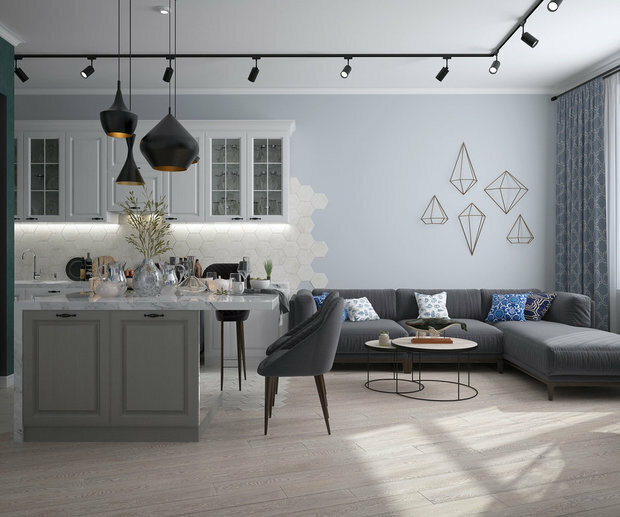 We have chosen among the projects of Russian designers 7 different options for visual combining the kitchen and living room. Not necessarily clearly distinguish between the kitchen and living room. For example, the designer Inna Azores most blurred the distinction between using tile of kitchen apron. She chose a tile fashion hexagonal shape, which goes beyond the borders of the headset on the wall above the sofa. 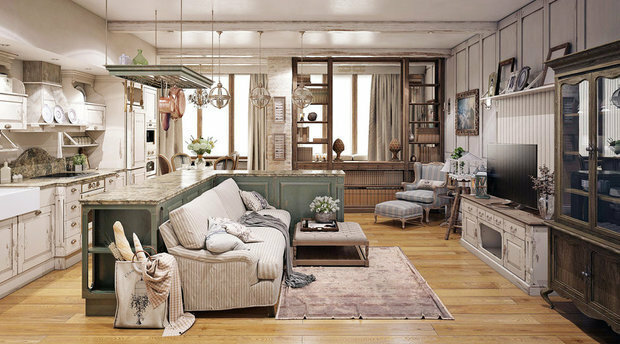 Another way to visually combine the kitchen and living room to share floor. But what to choose? Flooring is not always practical in the kitchen, granite and stone are too cold for the living room. The architects Alevtina Butuzova and Elizabeth Khlebnikov made a bet on a marble base, but in the living room laid carpet of the floorboard. 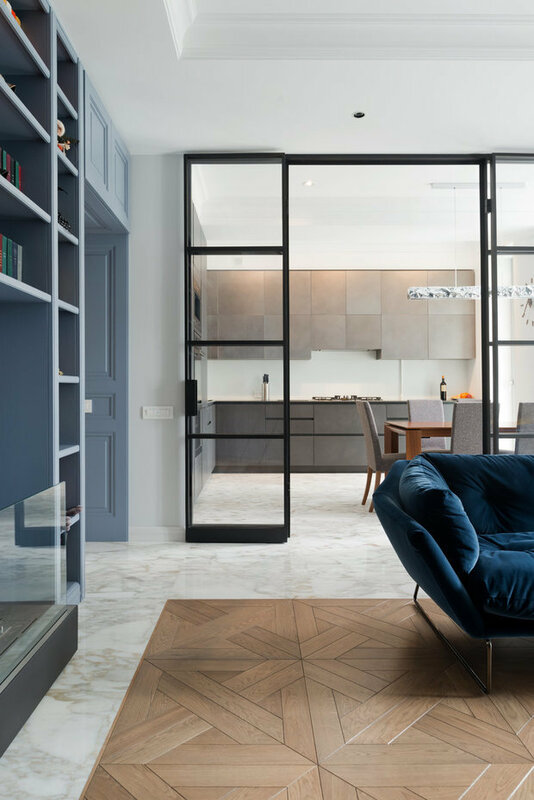 The basis of the interior of the whole apartment designer Daria Misyura took the style of Provence. 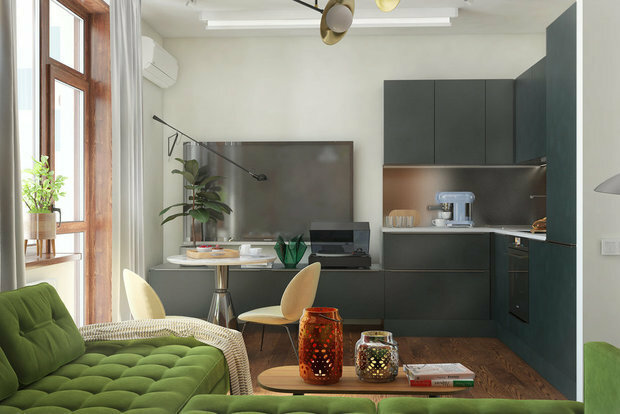 To kitchen-living room looked harmoniously and holistically, in accordance with the style picked absolutely all the furniture: chairs, a sofa, an armchair, a chest of drawers under the TV, the bar and the suspension above it for kitchen utensils, even built-in appliances! In a Studio apartment area of 54 sq. m. there was no room for zoning of space, thus the designer Manana Khuchua chose not just the furniture in the same style. She used the same facades for all furniture in the living room-the kitchen. Therefore, the drawers under the TV and kitchen seamlessly flow into one another. If for kitchen design-living room is modern style, you can make the cooking area and completely invisible. So did the architects from INT2 architecture. In the center of the apartment in the house built in 1917 they built a minimalist black cube, which hides all built-in appliances. Except that the sink and the hob is left on the mind is brought to the island. The door to this kitchen does not interfere with proper rest in the living room. The designers of CO:interior for combining the kitchen and living room decided to use a single colour. But to make the interior monochrome did not. For a bright kitchen chose set with pale blue facades that echo the shade of the Wallpaper in the living area. And diluted colours green, grey, black and white, and shades of natural wood. So both spaces look holistically, but not boring. A more complex and subtle solution preferred designers Paul Naumenko and Alexander Kozlov. In your project, they only demolished part of the wall between the living room and kitchen. Behind it lies the dining area and the living room a feeling of privacy. Both are solved in dark grey tones, and for both selected dark olive accent color. In the living room matched the corresponding seat upholstery, and the kitchen – tile for the apron. 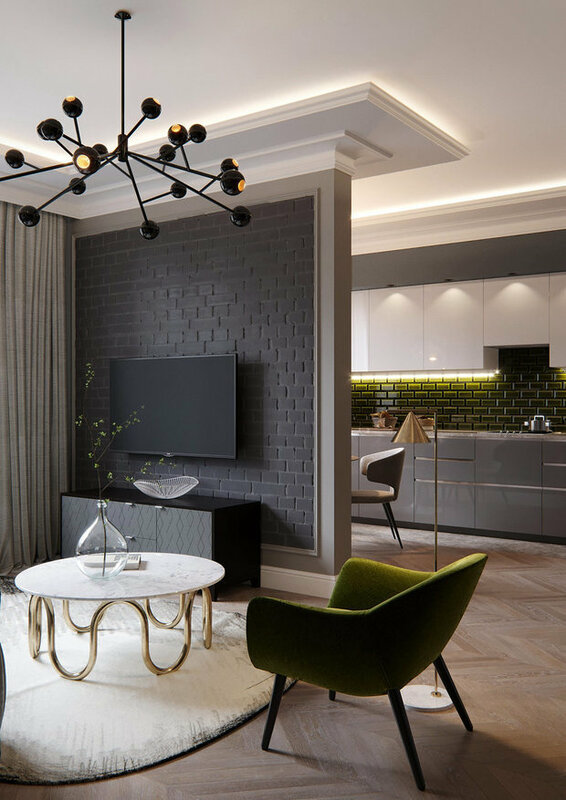 Sometimes, in order to stylistically unite the living room and kitchen, you need to consider even the smallest details. As a color accent designer Masha Gubkina chose copper. First, a copper hood, and it picked up the floor lamp, dishes, and small accessories in the living room. Thanks to this developed color-texture picture of the main room of the apartment.